Following the expiration of the homebuyer tax credit, sales of both new and existing homes fell dramatically in July, demonstrating the challenges faced by the housing market as it transitions away from government-stimulated purchases. Buyers who rushed to place homes under contract prior to the April 30 expiration of the tax credit compressed future sales into the early part of 2010. As expected, this caused July home sales to decline, with closings dropping at the steepest one-month rate on record. With the bulk of transactions for the year squeezed into the first half, it will take several quarters to refill the pool of prospective homebuyers and increase sales volume to levels indicative of a recovery. 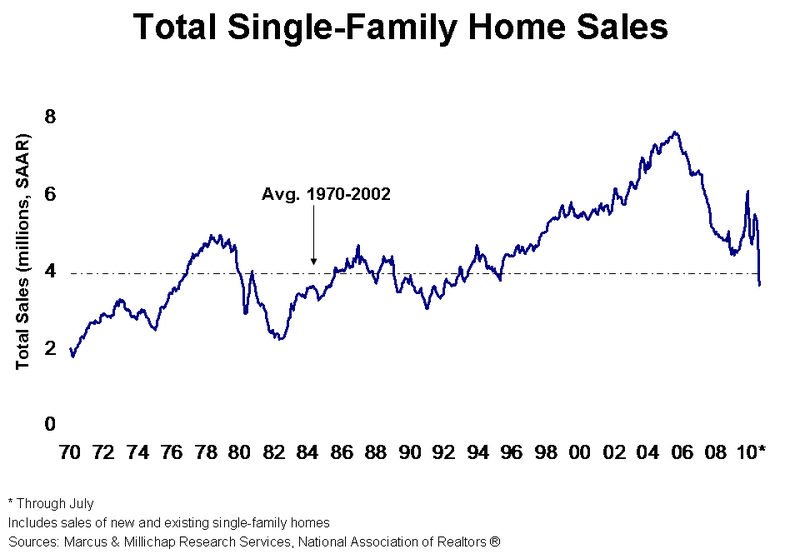 This weakening will place additional stress on the economic recovery as positive momentum from home sales generated in the first half of the year wanes. Government stimulus supported a rebound in home sales through the initial phase of the recovery, but in the absence of such incentives, existing home sales in July slowed to 3.83 million annualized units, down 27.2 percent from June. While the month-to-month drop in existing home sales was steep, the race to push closings through the system inflated the May and June figures, magnifying the July decline. New home sales in July fell 12.4 percent to 276,000 annualized units, reflecting the loss of the tax credit and rising preference for foreclosures and distressed homes. Although the end of the homebuyer tax credit will suppress home sales in the second half, favorable housing affordability and strengthened household balance sheets will be a positive component in the future foundation for a recovery. Interest rates on fixed-rate home mortgages dropped to an all-time low this week, reaching 4.36 percent, while the median home price remains more than 20 percent below prices at the height of the market. As a result, well-qualified households able to access financing are positioned to benefit from the cost savings presented by low interest rates and home prices, despite the end of the tax credit. However, exceptionally tight lending criteria remains a barrier for many prospective homebuyers and continuing caution will restrain others from entering the market. Until consistent job formations take hold, likely in mid-2011, and lenders loosen their lending criteria, home sales will continue to languish at existing levels. Expiration of the homebuyer tax credit will boost apartment demand in the second half of the year as the number of individuals leaping into ownership subsides. Slower but continued job creation also will deepen the rental pool, largely driven by the “de-bundling” of households merged during the height of the recession. The national labor market is projected to increase by 1.3 million jobs this year, or 1 percent, and with apartment construction expected to hit a 15-year low, the apartment sector will post notable occupancy gains in the second half. Vacancy will finish the year at 7.4 percent, down 60 basis points from 2009 and the first annual improvement in two years. Low mortgage rates have encouraged many households to refinance, helping strengthen their financial positions and supporting greater discretionary spending. Refinance applications have increased as mortgage rates have fallen and now account for 82 percent of mortgage applications. For some, these trends have raised household discretionary income and will likely positively impact retail sales. This more positive outlook will lead to greater stability through the remainder of the year, with the vacancy rate anticipated to rise just 40 basis points in the second half to 10.4 percent. This entry was written by marcusmillichap, posted on September 5, 2010 at 8:51 pm, filed under Research and tagged Housing. Bookmark the permalink. Follow any comments here with the RSS feed for this post. Trackbacks are closed, but you can post a comment. a déjà vu of 1986, when significant tax code revisions took effect and the capital gains rate increased from 20% to 28%. Those in the know say investor liquidations are likely to double the total realized capital gains from the previous year. This is really good news for home buyers or lenders and that’s why, these are the best times for real estate investment. We’ll quickly catch your rss as I are not able to locating your own e-mail registration web page link or perhaps e-newsletter assistance. Accomplish you’ve just about any? Remember to well then, i’ll recognise to ensure I really could register. Many thanks.